Walmart is sending out mailings to customers, letting them know what Black Friday deals are in their area. While Kotaku hasn't seen the ads for everywhere, it has seen the one Atlanta. This is it. While some of the smaller items will vary from store to store, the blue chip items—here, a blue Nintendo Wii—should be the same. The "limited edition" Blue Wii is priced at $99.96, a good deal if you don't already own one. It's way cheaper than the $149.99 that the Wii is priced at elsewhere. Walmart's other blue chip item is also, oddly, blue: It's a PS3 DualShock 3 controller, which is $54.96 and a Walmart exclusive. There are also PS3 and Xbox 360 Kinect bundles, priced at $199.96 and $199.96 respectively . There are also a whole host of games, priced at $10, $15, and $28. The ad shows what titles you could expect. 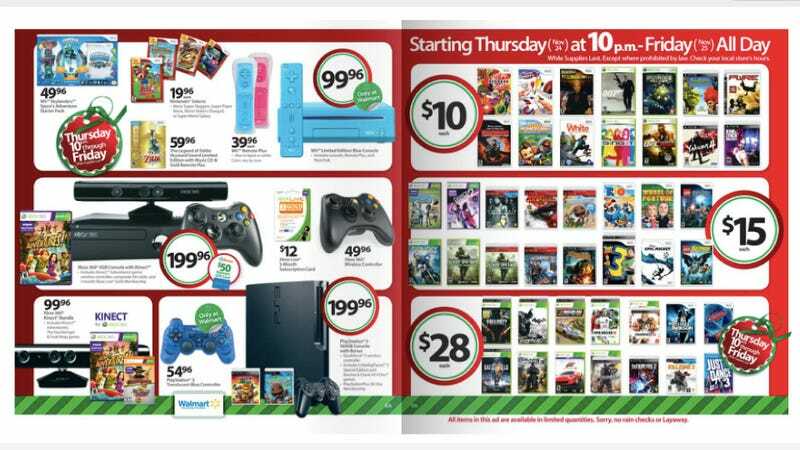 Walmart's Black Friday sales start Nov. 24 at 10pm and runs all day Friday Nov. 25. Find the Walmart store closest to you in the link below.